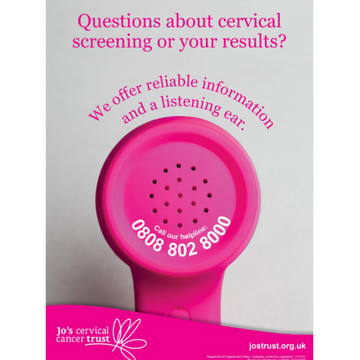 An A4 branded poster that promotes the Jo’s Cervical Cancer Trust Helpline to people with questions about cervical screening (smear test) or their results. Ideal for use in GP surgeries or at awareness events. Available to download or order as a printed poster.